Have you always wanted the body of a Victoria’s Secret Angel, but never knew how to achieve it? The Angels are all known for their drop-dead gorgeous looks, but also their amazingly toned physiques which some might say were crafted by the gods themselves! We share with you just a few workouts which are used by some of the Angels themselves, to create their much sought after physiques. The Namibian native and VS Angel has been known to take part in swimming and water sports to maintain her naturally slender physique. Paddle boarding, surfing and swimming laps are just some of the ways she chooses to tone her body, apart from a few pilates classes throughout the week. With a workout routine mainly consisting of ballet and pilates, there’s no reason Miranda Kerr has an incredible body! Even though she’s usually working on a tight schedule, she regularly attends Ballet Beautiful classes in New York City, and follows the Blood Type Diet in order to stay healthy and keep at a consistent weight. Not only does Candice Swanepoel love to box on a regular basis, but she also enjoys barre lessons which help to keep her entire body toned. The South African native also takes part in resistance training up to three times a week, which allows her diet to be a little more indulgent than the other angels. Rather than focusing on a particular part of her body to work on, Erin Heatherton takes part in HIIT which keeps the entire body toned and lean. While weight resistance one of her favourite workout routines, she does take part in pilates, yoga and running to keep fit and healthy. After the birth of her second child, Adriana Lima enlisted the help of a trainer to help get her pre-baby body back. Her workout routine is similar to the other angels, and mostly consists of pilates and boxing training. Whether you despise the idea of getting in some exercise throughout the week, or simply just don’t have the time, we can all agree that starting something new is often the most difficult. Take part in activities that don’t feel forced, and better yet, join a team or bring a friend along with you to ease the pain. Most people are motivated first thing in the morning, so if you can identify with this, it is best to start getting active as soon as you wake up. Simple ways to start the day include a leisurely stroll around the neighbourhood, walking the dog, and heading down to the local park. Free some time at home and do a few jumping jacks, squats, and pushups. Not only will this help your flexibility, but can be done almost anywhere there is enough space. Other exercises could include doing lunges while brushing your teeth, squatting while watching television or even planking. Sometimes it is good to have a distraction on while you work out, it helps time fly. Leave the car at home and opt for a leisurely walk, or even take public transport instead. We’re not suggesting you run for the bus, but this will give your body some much needed exercise (and save some money on petrol!). Generally, if your diet is consistent, then your weight will be too. Limit the amount of times you indulge in chocolate, sweets and alcohol which could be compromising that fit body. Cheat days are a good idea if you want to pig out once a week, but don’t let this behaviour drag on for days. Seriously! Sanford Bennett created a bunch of exercises which are designed to be in bed, with the covers on. One particular exercise which aims to work out the triceps, back and upper arm muscles requires you to lie on your side, grasp your right arm and pull back. Where possible, ditch the escalator, elevator and anything in between for the stairs. This simple change will build up slowly, and leave your legs looking and feeling better each day. Is there any wonder why you feel exhausted after tidying up the house? 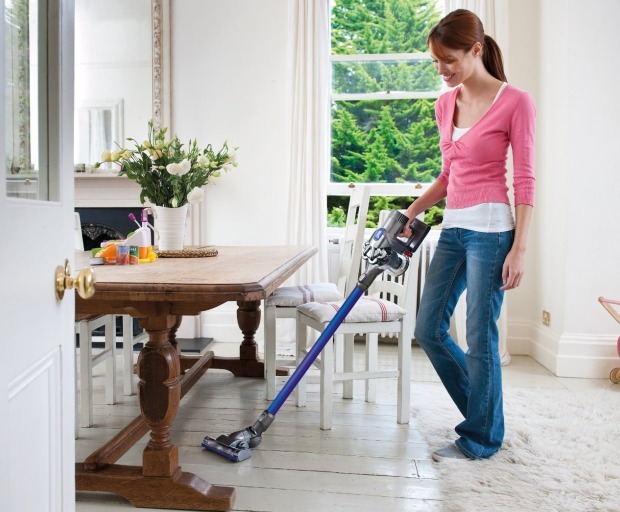 Vacuuming, cleaning, mopping and washing all are great exercises which work out the entire body. They may not seem like hard work, but at least an hour a day will prove good for your body. Over the past few years, many women and men have turned to pole dancing for an effective all-body workout. Pole workouts are often aimed at strengthening the core muscles, and toning the entire body. The great news is that you can start at any level – whether it be beginner, intermediate or advanced lessons! A simple pole dancing lesson will help to shed down a tremendous amount of weight, when compared to conventional workout routines. The core muscles are continuously being used to hold up the rest of the body, and this will allow you to shed the weight fast. Known to burn as many as 250 calories in just one session! Unlike going to the gym or working out alone, pole dancing for fitness is conducted in small groups of usually 5 women. This means that the instructor can easily interact with the participants, and they can all offer each other moral support throughout their individual journeys. Not only is pole dancing a physically tiring workout, but it is also extremely rewarding. Despite starting as a beginner, you will quickly pick up the technique, and find it easier to adjust after each session. Did you ever think that pole dancing could relieve signs of depression and mental illness? The various techniques allow the body to release endorphin hormones into the brain – which make you feel happier and increasingly relaxed with time. If you want to improve your posture from the many hours slumped in front of the computer, try out at least one pole dancing class. Many of the routines rely on stretching out the entire body, and working on a strong foundation for many of the difficult routines ahead. While pole dancing can help to relieve sore muscles and repair joint mobility, the intense workout can also improve flexibility. By regularly working out these muscles, the body will be less immune to general aches, pains and muscle spasms which come with daily life. Regular workouts have the tendency to aid sleep, since muscles are stretched and used more frequently, (you might also be tired from all the workout on the core muscles, arms and legs!). Have you ever tried fitness pole dancing?